This is a pretty polarizing film. For every "I loved it," I heard an "I hated it." Readers, I didn't love it, I didn't hate it - rather, I didn't NOT love it, if that makes any sense. 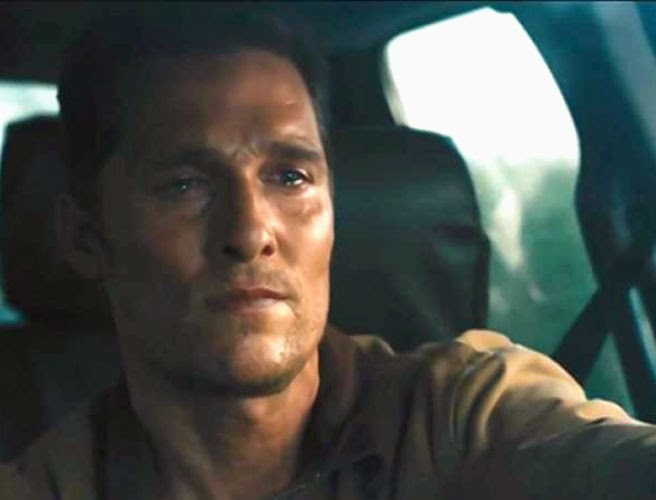 Matt McConaughey is an absolute gold mine in this role - the more I see of him, the more I like him - and I wouldn't be surprised one bit if the Academy pulls another "two Oscars in a row," a la Tom Hanks (Philadelphia and Forrest Gump). If you're into Sci Fi, you will adore this movie. As a fan of "Gravity" and "Alien," I appreciated the spacial and Sci Fi elements of it, but could have stood for it to be about 30 minutes shorter. Don't they know people can't sit through nearly a three hour long movie? I mean, I was engrossed for as long as possible, but they lost me about 2 hours and 15 minutes in. This film is as much about Sci Fi as it is about family relationships. Several scenes between McConaughey and the beautiful, brilliant child who plays his daughter will nearly bring tears to your eyes. He is so believable in this role and seems truly genuine, showing depth that I haven't seen before. (Though some moments reminded me all too much of his infamous Lincoln commercials, see: monotone monologues, gazing out into traffic space.) Joking aside, McConaughey will win you over, even if that's the only thing you take from this film. The females who play Cooper's daughter Murph shine. Mackenzie Foy (as young Murph) had such real chemistry with McConaughey - your heart breaks for her as he drives away to his mission after a reluctant goodbye. I can't get enough of Jessica Chastain, who plays older Murph. Such a beauty and natural talent. John Lithgow isn't in the film long enough as Cooper's father-in-law, and several cameos make for nice surprises (Casey Affleck, Ellen Burstyn, Matt Damon and Topher Grace being among them). This film is without a doubt going to receive several award nominations this year. You'd be missing out to not see it, but be prepared for a long afternoon, to pay attention, and to hear a lot of McConaughey's Southern drawl and "whistle S," as I like to call it. The ending is a bit far-fetched, but I was glad to know how they wrapped up the story, though it could have been done a lot sooner.